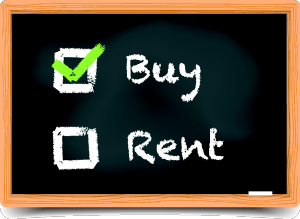 You are here: Home » Blogging » Is It Time to Stop Renting? It’s not your imagination that rent keeps going up. In fact, across the United States, from the end of summer 2013 to the end of summer 2014 rents increased over six percent … and in some housing markets rents increased by as much as 10%. Perhaps now is the time to make the move to home ownership. There are different costs and benefits associated with owning versus renting, so a simple comparison of monthly payments might lead you to believe one is better over the other. To calculate the real differences, and therefore the real cost or benefit, you need to dig a little deeper. For instance, in this New York Times article, they used a $250,000 home as their example with a 9-year tenure, a 30-year fixed 4.34% loan with a 20% down payment. In addition to these basic costs, they factored in taxes, maintenance and fees (including estimated closing costs). Using the resulting monthly cost of $961, you can determine if buying or renting is better if you can rent a similar home for less than $961 (assuming the rent remains static for the nine years. You can change the amounts in the calculator by moving the sliders so you can put in your own numbers. Remember, however, that there are extra fees associated with renting too: broker fees, security deposits, renters’ insurance and pet fees, among others. Additionally is the potential for rent increases at the end of each lease period. One benefit of home ownership not taken into account in this model is the potential to reduce your income tax burden. A portion of your mortgage interest may be deductible as well as some of the points and property taxes. Before buying, talk to us about the additional costs of home ownership. We can help you estimate maintenance expenses such as a new roof or heating and air-conditioning system. When we help you budget for your new house, we can factor in what you’ll need to set aside to cover these expenses. Tax increases, levies for schools, roads and community improvements and other municipal costs can increase even in your first year of home ownership so when calculating what you can afford, add in a little extra for taxes too. If you purchase a condominium or a home that is part of an association, you can expect association dues to rise annually unless the bylaws stipulate otherwise. Since one of the factors affecting association costs is insurance, expect your dues to increase, or to have a special assessment if your community suffers storm damage or liability costs. In addition, speaking of insurance, your premiums tend to go up each year as well. Consider these extra items as part of your overall housing cost. Liability insurance—as the homeowner, if someone is injured on your property you’re responsible. You’ll need to make sure your homeowners’ insurance includes liability. Buying a home is a long-term commitment. We want to partner with you to make sure you’re able to both keep and enjoy that commitment. Call us today and we’ll help you prepare for that move from renting to owning … eyes wide open, so that your purchase remains a lifelong joy.